Welcome to India's leading Hospital Furniture and Equipments Manufacturer and Exporter - D4 Surgicals of India We are the supplier and distributor of top quality orthopedic implants, medical tools and surgical instruments along with hospital furniture. We have been serving for over three decades at cost effective prices to many well-known medical centers, hospitals, exporters, traders, doctors and medical practitioners in India and abroad. We export wide range of orthopaedic, hospital, medical and homecare products from India to US, UK, Canada, UAE, Australia, Europe and other countries. Our production system has advance technology and facilities to undertake Private Labeling Assignments wherein we manufacture OEM Products, as per the specifications of the buyer, which are placed in the market by the Buyer / Private Labeler. We have keen interest in expanding this OEM business with MNC companies all around the world. D4 Surgicals is contributing to better health care by designing, manufacturing, distributing and maintaining sophisticated medical and orthopedic equipments. As we deal in life saving equipments, we provide quick service at client's location through our dealer's network spread across the globe. 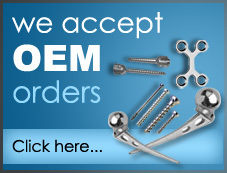 Have a look at our wide range of orthopedic implants, orthopaedic tools and other surgical instruments. We assure you to have the best orthopedic implants and instruments set by implementing world class quality control. We are certified ISO 9001:2000 Company with associate membership of WTC Mumbai, India and Dun & Bradstreet certification. Furnishing total projects, right from quality orthopedic implants, tools, hospital furniture to hospital management software. Providing services in project jobs to hospitals for healthcare facilities in semi-urban, urban or town / cities. Being fully aware of the need of 3rd world countries in the field of mass health care, we are at ease to execute any project work. Before starting the work, an initial survey and feedback of all relevant data of the site, a healthy hygienic environmental planning is done, detailing each section and departments, need of required equipments including orientation to technical and paramedical personnel etc. The company's mission is to provide high standard surgical equipments at attractive prices. One of the major reasons for the reasonable cost offered by D4S is its wide spread dealer's network, due to which company doesn't have to incur unnecessary cost of marketing and product promotion which other wise could have increased its cost. We invite all our potential customers to explore wide range of orthopedic tools and surgical instruments at D4 Surgicals. For any further information regarding orthopaedic products, directly contact us and help us serve you better. Orthopedic-Implants.net a one of the top orthopedic implant and instrument manufacturing companies in India. We also supply and exports orthopedic implants and surgical instruments to worldwide countries like USA, UK, Germany, Sri Lanka, Bangladesh, and others.